Different power modes can cater to different personalities. "Smartwatches are a highly integrated platform," said Pankaj Kedia, Qualcomm's senior director of smart wearables, at the company's Snapdragon Wear 3100 event earlier today. To that end, Qualcomm has been working closely with Google over the past few years or so to perfect its chipset with Wear OS in mind. That's why, thanks to the new Snapdragon Wear 3100 chipset, the next version of Wear OS will support three new modes: rich-ambient mode, a dedicated sports mode plus a traditional watch mode. We saw a brief demo of all three modes at Qualcomm's event earlier today, and all three appear to have a specific theme in mind: to make the smartwatch feel as close to a real watch as possible. Take rich-ambient mode, for example. The idea behind this is that when the watch is inactive, the face won't just go black. Instead, it'll switch to an enhanced ambient mode where you'll still see the time as well as various calculations like your heart rate or step count. This ambient mode runs just on the Snapdragon Wear 3100's co-processor (instead of the main processor), so it'll require much less power. In the Qualcomm reference design seen at the event, the difference between the active mode and the ambient mode was almost not discernible. The one variation appears to be the brightness level -- ambient mode is ever-so-slightly dimmer. But according to a Qualcomm spokesperson, the adaptive brightness will still be active, so the display will be brighter in dark environments and less bright in sunny environments, for example. But let's say you want to save even more battery life. In that case, you could have the option to switch to a traditional watch mode, which shows only the date and time. Depending on the vendor, the smartwatch might even switch from ambient mode to traditional watch mode automatically after a certain dip in battery levels. (In Qualcomm's reference design at least, you have to activate it manually by turning on the battery-saver mode.) 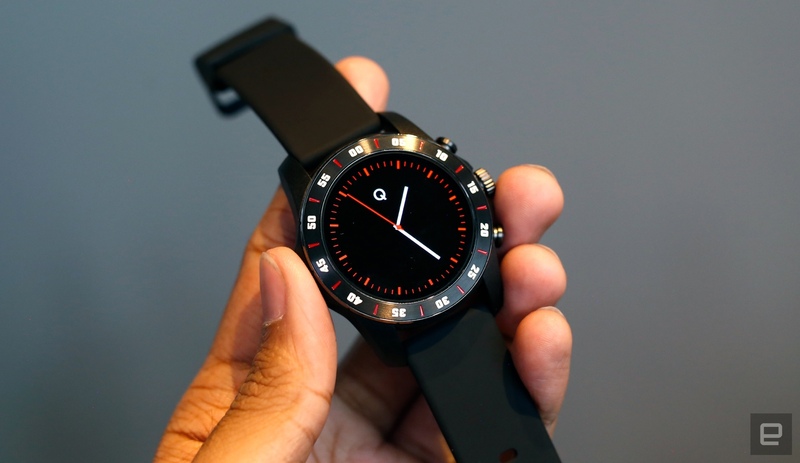 According to a Qualcomm spokesperson, your smartwatch could last for a whole month in full charge when in this mode. Most importantly, though, the traditional-watch mode really did seem, like, well, a traditional watch, with a regular watch face and a date indicator. Longevity is also crucial when you're using a smartwatch as a fitness tracker, so the dedicated sports mode will definitely see a lot of use. Once enabled, it will essentially switch the watch over to the co-processor and shut off the A7 processor cores entirely. You'll still get your base functions like a GPS, the time and Bluetooth, but other more complicated functions are put to rest while you get your sweat on. In a way, Qualcomm's chosen architecture means they've made smartwatches with multiple personalities possible -- you won't necessarily need to own a fitness wearable and a smartwatch, because you'll get the battery life, performance and interactivity of both in a single device. After years of what felt like smartwatch stagnation, Qualcomm's decisions just might make for a golden age of wearables. Of course, we'll have to wait and see: The first Wear 3100-powered watch won't ship until October.